NOTE: This feature is available only in PRO version of Woo Discount Rules. This purchased history based discount is given in accordance with the value/products that customer has purchased previously. 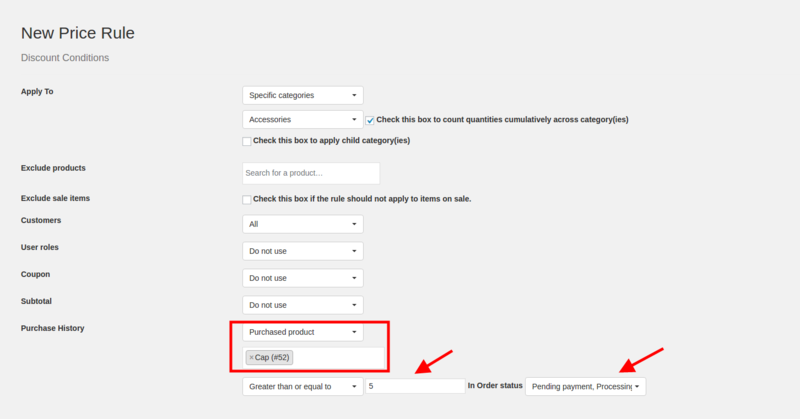 You can be able to associate any Quantity based price rules on Purchase History basis. Example: Provide 10% discount if their previous purchased amount is greater than 300. Provide a percentage discount when the user's previous purchased amount is greater than or equal to $300. I am providing a 20% discount. Store owners, will always wish to provide a discount to customers whose purchased order (Number of purchases) is more (a customer has ordered many times like 10 in a row). You want to provide discount to users who has purchased previously. You can include the Order status count like, all the orders which are in Processing, On-Hold as well as in Completed (as per your requirement). So, the orders will be counted based on the order statuses you have selected and discount will be applied. 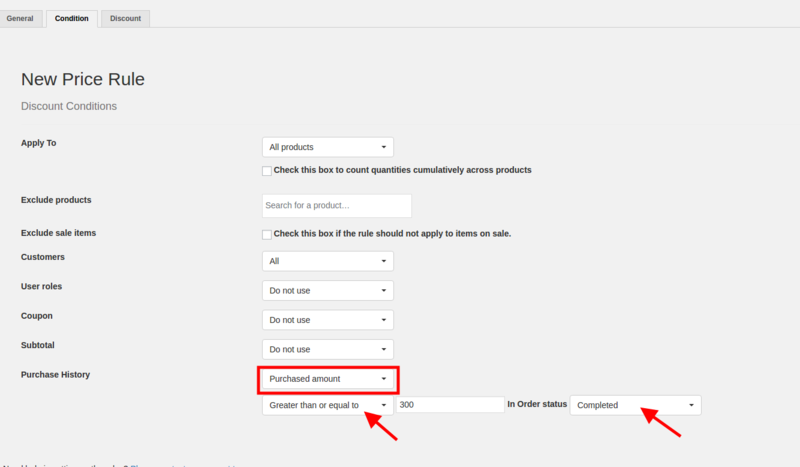 To create a product discount based on the number of orders more than 10, get a Product A (Cap) also with a condition if the minimum quantity in the cart is 5 and above. Minimum - Maximum = 5-10. This rules checks both the purchase history as well as the products which are in the cart. You can also limit the percentage of the Free quantity here it is 100%, you can also provide a 50% off. 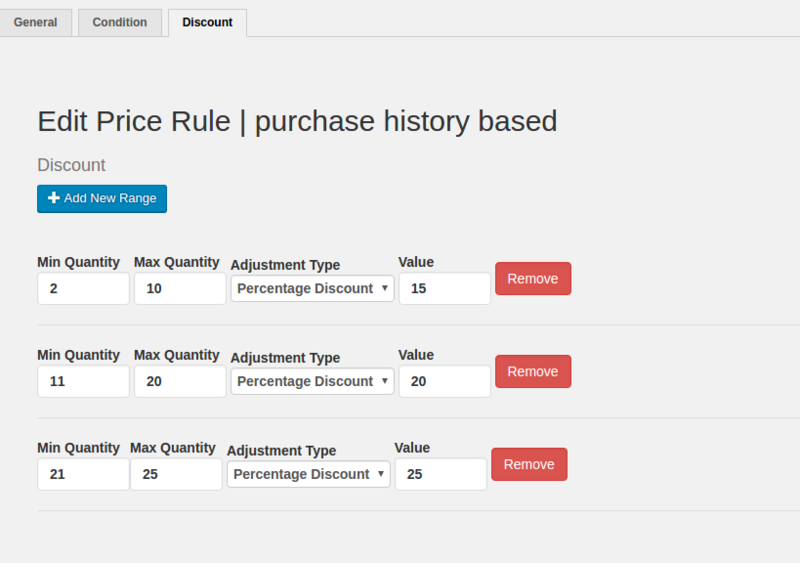 Similarly, using Number of order, you can set multiple discount rules. If a customer purchases a product regularly in the store, it will encourage him to purchase more when he is given a discount based on it. You can associate any Price discount rule with this Purchased product condition. Get discount in the same product that he has purchased before. Get discount in another product B when product A has been purchased for 5 or more time before. The above will check for a specific category as well as the purchased product (Cap) 5 or more times, with respect to order statuses in Pending payment, Processing and completed as well (Choose the Order status as per you requirement). 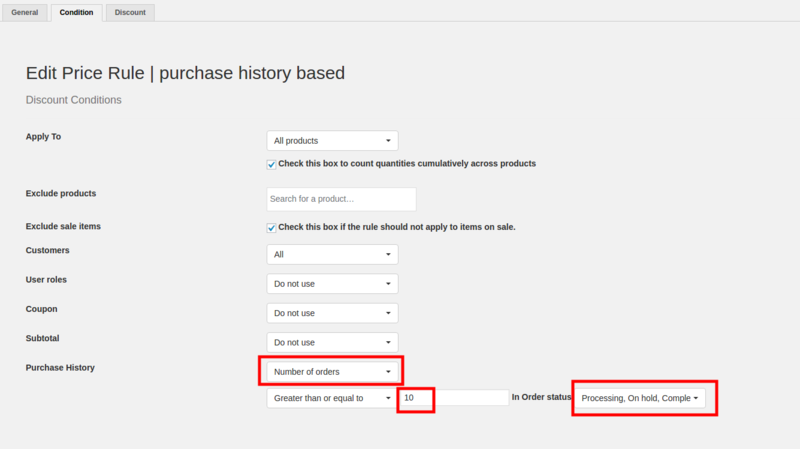 When the specified category has 1 - 5 quantities, provide a 50% discount in the same products that gives in the category. You can select the product you want the discount in the Discount tab. you can have all the three options in the cart based rules where you can give a discount of a price or percentage in the cart. It is also possible to have a free shipping as a discount scenario when it comes to cart discount. 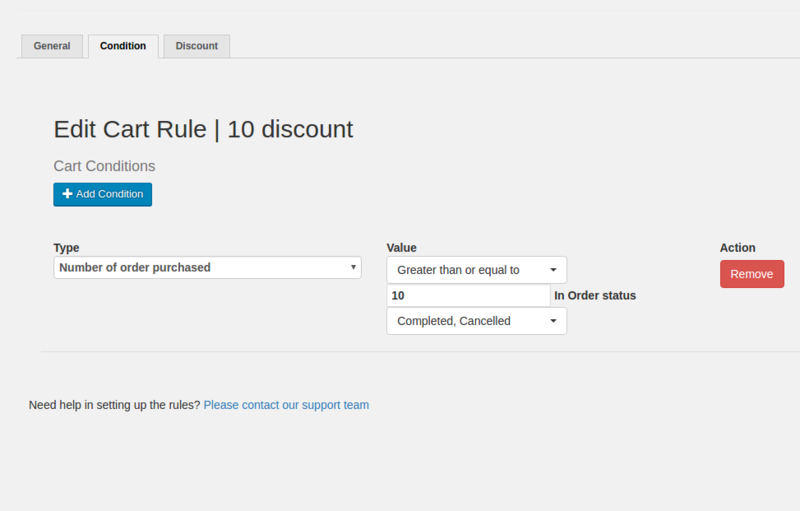 In cart discount rules, you can combine conditions, which works as an AND operation. For more Cart Discount Conditions.